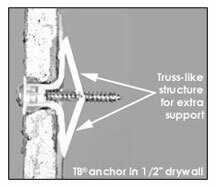 The key-activated positive locking action causes the anchor to become a rigid, weight distributing truss in hollow walls. Safe and reliable holding power in drywall, hollow or plaster walls and in hollow doors in thin panels. Pre-installs without screw and can be used with a screw gun. Protects the wall from spalling and breakthrough. A screwdriver can be used to make the hole in the wall. Use with stainless steel or brass screws in any corrosive environment. Colorless and translucent - blends into wall color and texture. Grip Range: 5/8" to 3/4"
Wrought brass countersunk washer for #8 screw head.